For the last six years, Chick-fil-A Foundation has been working closely with Junior Achievement to expand youth education. Having first partnered to create the JA Chick-fil-A Foundation Discovery Center in downtown Atlanta in 2013, today over 21 Chick-fil-A Operator Markets sponsor simulated store fronts at their local JA facilities, while another 268 Operators support JA in other capacities. Most recently, JA introduced its “school-within-a-school” concept called JA Academy. 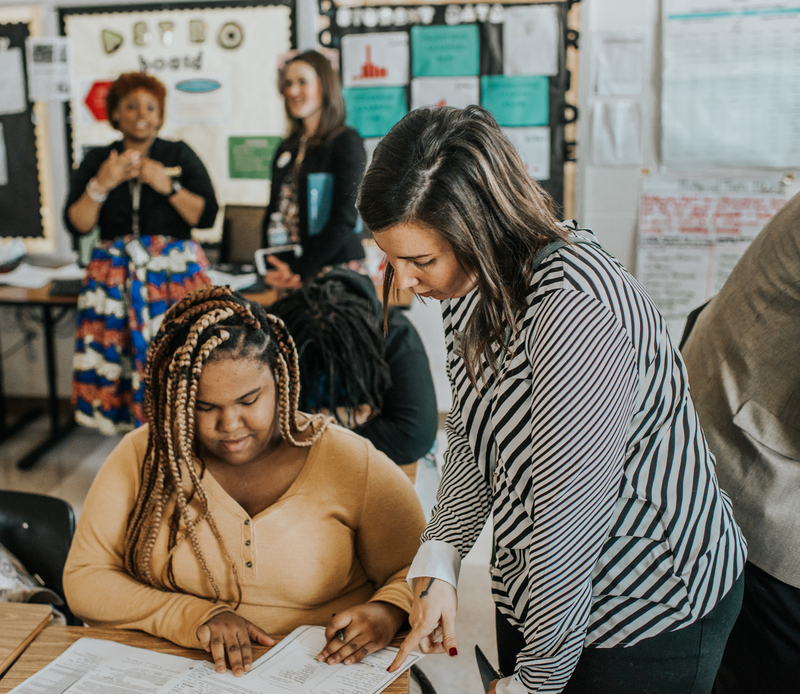 Currently being piloted in Atlanta, the immersive program allows students the opportunity to experience a magnet-style approach to learning — all while staying within the four walls of their public high school.JA works with counselors and school admin to ensure they are targeting the middle 80% of students, which reflects the greater society. Launched in 2015 at Banneker High School, JA Academy has since expanded to several other high schools within the Fulton County, Atlanta Public Schools, Cobb County, and Gwinnett County School Systems.Chick-fil-A Foundation is proud to be a corporate partner of JA Academy at Banneker and to serve as the leadpartner of JA Academy’s newest addition, Frederick Douglass High School, which opened in fall 2017. 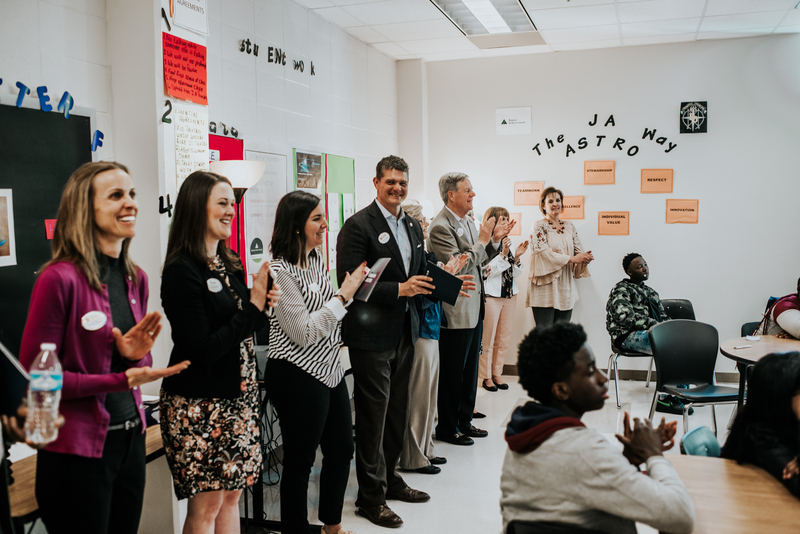 Here’s how it works: JA Academy teaches students how to approach and solve real-life issues through practical exercises such as business case challenges, which are created by partners like Chick-fil-A. The challenge culminated with the four groups with the best case challenge visiting the Chick-fil-A Support Center to present before a panel of Operators, staff and executives. While Douglass recently completed its first school year with JA Academy, the impact is already apparent. According to TeCori, the discipline and suspension rate of JA Academy students is remarkably lower than the rest of the school, and the absentee rate has dropped 60 percent. “The students are excited to learn and feel safe in the classroom, allowing them to make the most of their education,” TeCori says. Much of this early success can be attributed to the JA Academy teachers, like Kimberly Hughley, who see the long-term potential for this type of teaching approach. During the 2017-18 school year, 74 students enrolled in the program at Douglass. With the long-term goal of including 150 students per grade level, JA Academy plans to expand to 175-200 students at Douglass in the fall.